Emergency for mine clearance of the Nineveh plain! ACTION – We need your help to fund the mine-clearing of four Kakai villages and two Christian villages liberated from ISIS in the Niniveh plain. This first step in mine-clearing efforts will also give the opportunity to train local mine-clearing experts, Kakais and Christians, so that they can further help clear other areas from landmines in the Niniveh plain, when it is freed. ISIS jihadists have invaded a part of Irak more than two years ago, but their influence is gradually weakening. In the North, the international coalition against ISIS is anticipating the liberation of the Niniveh plain and the city of Mossul within the year, which gives hope to all displaced populations. 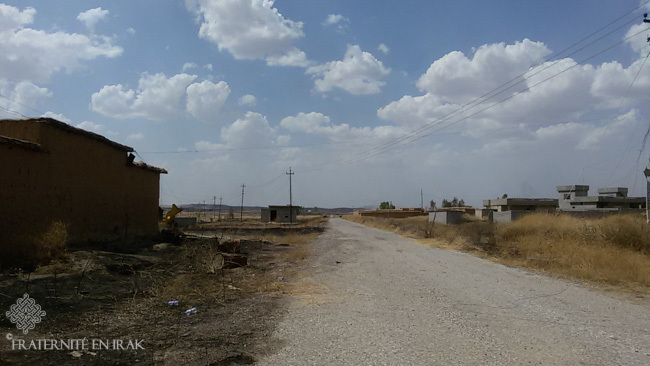 At the end of May 2016, the Kurdish Peshmerga forces’s first offensive freed some Kakai villages in the plain. Unfortunately, in these newly liberated villages, ISIS booby-trapped and mined the roads, buildings, houses and crop fields. 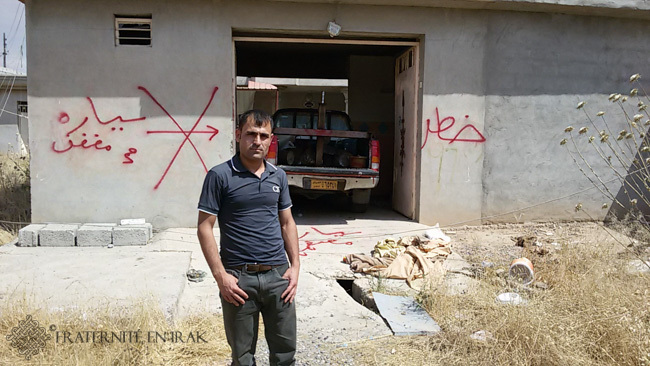 Members of Fraternity in Iraq who gathered inhabitants’ testimonials, and were able to go to the site, witnessed that booby-traps and mines had been carefully set up by the terrorists. The strategies are different from one area to another, making the mines even more difficult to detect. Some get activated from a distance. A door opening in a street sets an explosion in another house. Some explosives are set randomly on the ground, some others in items of everyday life. Since the end of May, twelve people have died because of these mines while collecting personal belongings and checking on their houses. In 2014 already, in the northern part of the Niniveh plain, a young 14-year-old Christian boy had died while helping his father plow a field in an area that had been briefly occupied by ISIS. 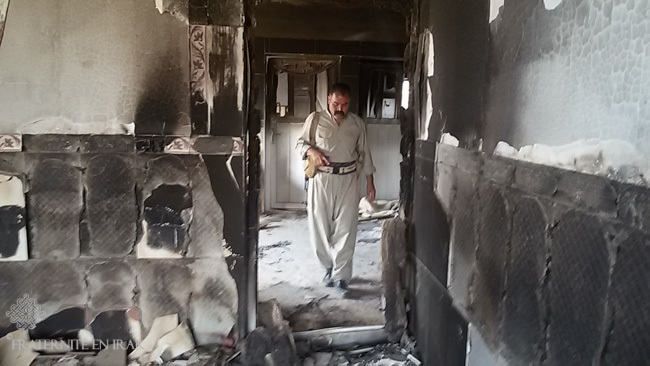 A man inspects a house in a newly-liberated village, a risky job which cost 12 people’s lives. They had come to collect belongings and check on their houses. Without mine-clearing, there can’t be any reconstruction. Yet the first liberated villages still haven’t been cleared. The Kurds who have repelled ISIS in these areas are engaged in direct combat against the jihadists and can’t commit to mine-clearing. The inhabitants can’t go back home — an unbearable wait for these people who have already spent two years away from their homes, living in very harsh conditions. There is also a real emergency as these first mine-clearing operations will help anticipate the necessary mine-clearing to come in the other areas of the Niniveh plain, which we hope will gradually be liberated. Professional mine-clearing experts will have the opportunity to train local people, who will then take part in the mine-clearing operations before any resettlement. 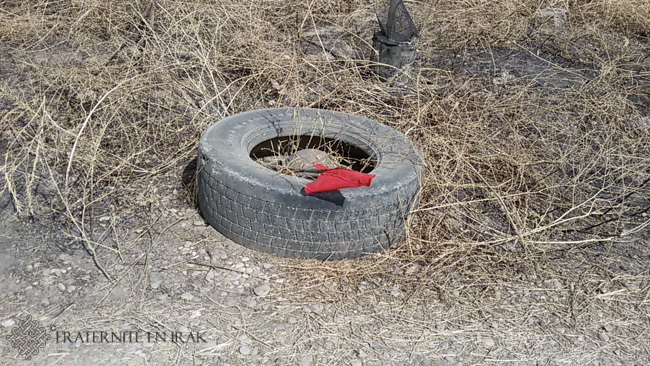 Everywhere in liberated villages, and on objects of everyday life, red flags indicate mines. What is the project carried by Fraternity in Iraq? 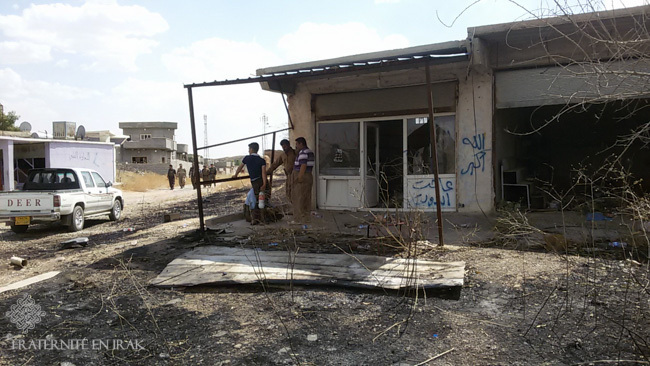 Fraternity in Iraq has assigned an expert NGO to the mine-clearing of the first six villages of the Niniveh plain. 21.200 inhabitants live in these six villages – as many people who will be reassured and will be able to go back to a normal life in their homes. The ONG partnering with the Brotherhood with Iraq has been present in Iraq for 20 years, and has neutralized more than 1.5 million landmines. It employs close to a thousand people, with a majority of Iraqi citizens. 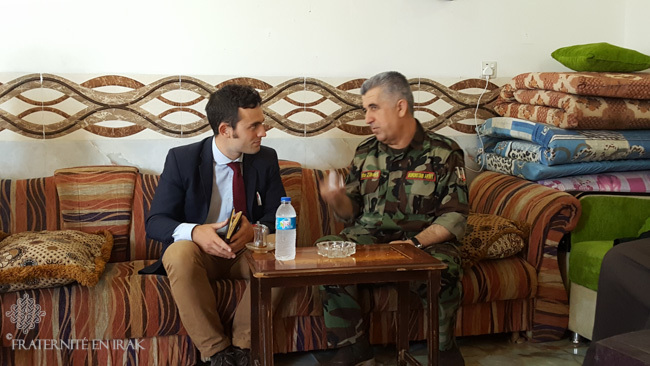 A member of Fraternity in Iraq discussing with Ato Zebari, who co-leads the front line of the Khazer zone. What is the budget of the operation? - The delivery and use of detection & neutralization material. In this 330.000-euro budget, Fraternity in Iraq needs to raise 150.000 euros (US$168,500). We need YOU (yes, you!) to help raise these 150.000 euros before the fall, which is the scheduled start of this first mine-clearing operation in the Niniveh plain. We are available to present this project at length, please don’t hesitate to contact us at contact@fraternite-en-irak.org. We will answer fast!